1) The full inspiration of the Scriptures as the infallible and inerrent Word of God. 2) The Fall of Man and his consequent inability to all spiritual good. 3) The resurrection of the dead and the coming again of Christ to judge the world. 4) The substitutionary sufferings of Christ for His people. 5) The sovereignty of God in election and regeneration of His people. 6) The absolute necessity of regeneration in order to salvation. 7) Salvation by faith – not of works. 8) The absolute necessity of the Holy Spirit’s operations to make the Gospel effective in conversion and sanctification. 9) The final perseverance of the people of God from falling away and being lost. 10) The necessity for holiness in walk, life and conversation of the people of God. The Church is Presbyterian in government and its subordinate standard is the Westminster Confession of Faith, a statement of belief held as being consistent with the Bible. It is the confession of the Church’s faith. We endeavour to proclaim the glorious message of salvation through a crucified and risen Redeemer, the Lord Jesus Christ. This was the message owned by the Lord in the best days our Land ever saw, when many were blessed and this is the message God still owns today. It is our aim to propagate our witness throughout society that others may be brought to saving faith in the Lord Jesus Christ. Faith is the Gift of God and comes by hearing the Word of God. Rom 10 v 17. Will you not seek a personal interest in the Gospel for yourself? We endeavour to preserve the testimony of the Church of the Reformation. Our supreme standard is the Bible as the inspired, infallible and inerrant Word of God. Our subordinate standard is the Westminster Confession of Faith. In public worship psalms alone are sung, to the exclusion of hymns and instrumental music. The services are led by men. The Free Church of Scotland (Continuing), believes the Bible to teach that women should not be ordained to the min­istry, nor lead in prayer at prayer meetings. It is the uniform practice throughout the Presbytery that in services of worship the congregation stands for prayer and remains seated during the singing of the praise. The minister of the congregation is usually assisted by visiting preachers over Communion seasons. 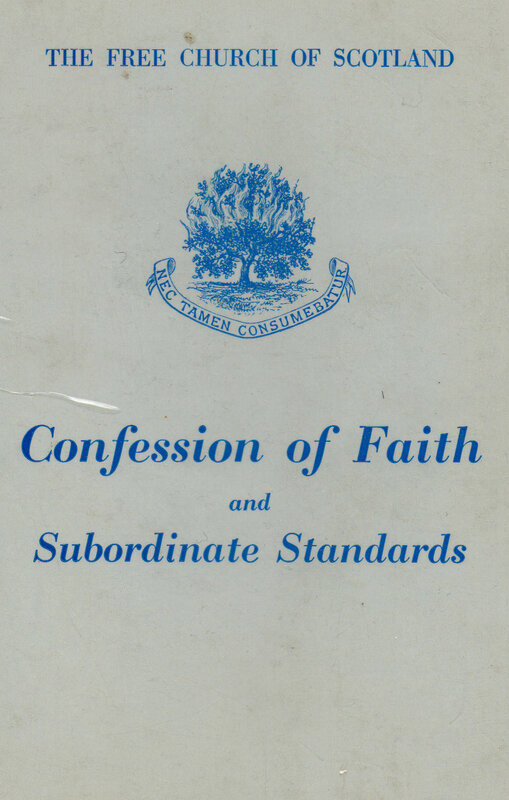 Click here to access a copy of the full Subordinate Standards and other Authorised Documents of the Free Church (1851).